From the green line painted on Fifth Avenue to the tartans, pipes and drums, New York's St. Patrick's Day Parade reveled in its long traditions. NEW YORK (AP) — From the green line painted on Fifth Avenue to the tartans, pipes and drums, New York's St. Patrick's Day Parade reveled in its long traditions. But to the marchers behind a green-and-lavender banner, it also marked a new era of inclusion at the nation's largest celebration of Irish heritage. A year after a limited easing of the parade's prohibition on gay groups, organizers opened the lineup more broadly to include activists who protested the ban for years. "I never thought I'd see the day when I could march up Fifth Avenue in the St. Patrick's Day Parade with my husband," said Brendan Fay, chairman of the Lavender and Green Alliance. "When we started in 1991, after getting arrested so many times for protesting the parade, wow, what a moment this is." Roughly 200,000 marchers followed the Fifth Avenue route, flanked by onlookers forming a sea of green. "We love New York City and the parade and being Irish for a day and having a drop," said Anna Silver, from Nutley, New Jersey, laughing with three friends who all wore bright green T-shirts with green ties and stovepipe hats. "I'm part Irish on my mother's side, but today I'm totally Irish." This year's parade honored the centennial of Ireland's Easter Rising against British rule. It was also broadcast live in Ireland and the United Kingdom for the first time. The grand marshal of the parade was former U.S. Sen. George Mitchell of Maine, who negotiated the Northern Ireland peace accord. The parade traces its history to 1762. For years, organizers said gay people could participate but couldn't carry signs or buttons celebrating their sexual identities. Organizers said they didn't want to divert focus from honoring Irish heritage. Irish gay advocates sued in the early 1990s, but judges said the parade organizers had a First Amendment right to choose participants in their event. Over the years, activists protested along the route, and some politicians boycotted. The pressure grew in 2014, when Mayor Bill de Blasio refused to march, and Guinness and Heineken withdrew their sponsorships. The sponsorships resumed when parade organizers opened a door to gay groups last year, allowing a contingent from parade sponsor NBCUniversal. But critics saw the gesture as tokenism. Meanwhile, Boston's St. Patrick's Day parade ended a ban on gay groups that organizers had successfully defended at the Supreme Court. In the ensuing months, gay marriage became legal throughout the U.S. and Ireland. 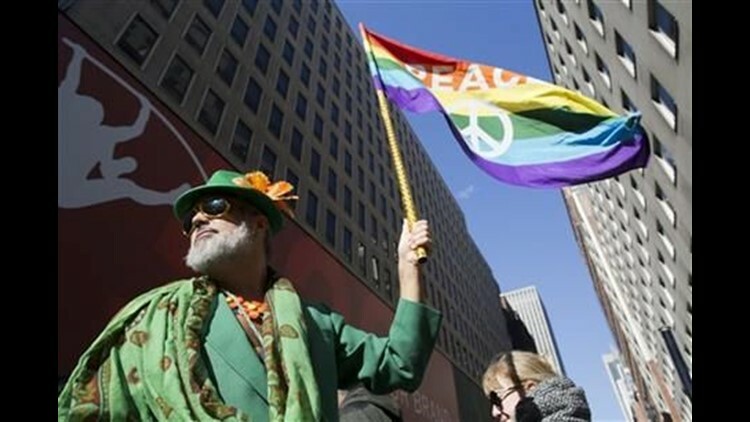 Against that backdrop, New York St. Patrick's Day Parade organizers said they'd add a second gay group this year to the parade ranks: the Lavender and Green Alliance, which had long protested the gay-group ban. De Blasio said, "Today everyone is celebrating together. Today, the city is at peace, and the city is unified, and we all feel tremendous pride in all of the people who brought us together." He actually marched twice, returning at the end of the parade to join the alliance as members stepped off. When they entered Fifth Avenue from their staging area, it was to the sound of cheers from the crowd. But not everyone felt that way. Some longtime parade participants have balked at the arrival of gay delegations. "It's contemptible," said Bill Donohue of the Catholic League. The group stopped marching last year, saying it was unfair of organizers to open the parade to a gay group but not to an anti-abortion one. Some Catholics gathered along the route Thursday to pray in protest. But Dillon Roger, visiting from Switzerland, thought the parade was "like a big carnival" and hadn't realized gay groups were kept from marching until recently. "I always thought the parade was a celebration of being Irish, not Catholic, so yes, it's a big symbol, an important thing for gays to march in the parade today," he said. Celebrations marking St. Patrick's Day also turned the streets of Savannah, Georgia, into a sea of green, as revelers in gaudy green hats and T-shirts filled the sidewalks and squares. In Ireland, record crowds celebrated the national holiday with a parade led by the country's most prominent disabled rights activist, Joanne O'Riordan, who was born without arms or legs. She beamed joyously as she steered her scooter past the estimated 550,000 lining the parade route in Dublin. Associated Press writers Alex Lynch in New York, Russ Bynum in Savannah, Georgia, and Shawn Pogatchnik in Dublin contributed to this report.